SuperFogeys - NEW CHARACTER: Hazmarty! Lots of new characters and redesigns with One Year Later, and this is where we tell you about them! Based on the comments underneath his first appearance, today’s is a popular one. Imagine if Homer Simpson got superpowers and super ugly and gross. Bill Updike was just a working stiff whose job was to push the right button at the Nuclear Power Plant just outside Fresno, CA until the Battle of Fresno changed his life forever. When, at the early stages of the battle’s expansion, a couple of supers mistakenly took their fight to the Plant and damaged some of the most crucial and hazardous areas of the plant, Bill was tasked with going in to seal off a radiation leak that threatened to blow the whole place sky high—taking Fresno right along with it. 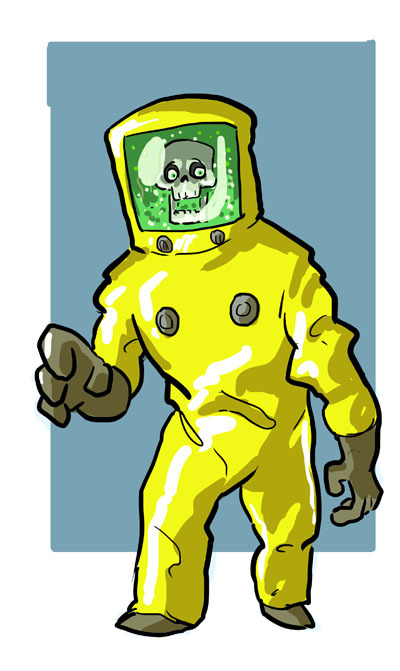 An accident of superpowers and nuclear energy stripped away Bill’s skin and muscle and most of his internal organs, leaving him a living, mutated skeleton in a vat of liquid radiation contained only by his hazmat suit. Mega Matt named Bill Hazmarty after noting his resemblance to Marty McFly when he first travels back in time in the movie Back to the Future. Bill resents the name, preferring to hold on to any of the last vestiges of his humanity he can grab. He much prefers Bill and will yell at anyone who calls him Hazmarty—which is everyone. Bill’s needs and wants are pretty simple and he’s known for being kind of a dunce, but at the end of the day he has a good heart and wants to help humanity however he can, even if he has no hope for himself. Hazmarty reminds me strikingly of the Dr. Who episode “Silence in the Library”. There’s an image from the show here. Much nicer backstory, though. I don’t know why it wasn’t my first thought, but you’re both totally right. One of my favorite Dr. Who episodes. Why not ‘Billirad’ instead? Y’know? Bill, plus ‘Millirad’ (a thousandth of a dose of ionized radiation, for those who aren’t nerds) and you get ‘Billirad’!